Last Friday, my friend came from New York City to visit me. Unfortunately, her boots were worn out and she got a new pair in Steve Madden. But it turns out everyone in Boston has a same pair of boots. She saw the boots on the bus, on the train, as well as in the Chinese supermarket. They may have different colors, but essentially share the same style. She once complaint to me, this could never happen in New York. New York may be the center of the world. The skyscrapers, the fashion arts, the night lives, all these make New York exciting. But for me, a foreigner lives in the States just for half a year, I prefer Boston, a city you can nearly walk to anywhere. You can find everything on Newbury Street, good restaurants, chain stores, as well as indie designers’ shop. But in New York, you need to drive hours from Fifth Ave to Brooklyn. I could never realize how different these two cities are before I came here, and experience it myself. They were just two similar spots in the Northeastern American Urban area in my mind then. I am always interested in how Americans think about their country. My friend and I had a conversation with a Bostonian together. He talked about New York, about Boston, as well as some other parts in the country. You was born in New York City and moved here in three. Do you take yourself as a Bostonian? Yes. I grew up in Boston almost all my life. My mother’s family has been here for 10 generations, they are from England. I moved away from Boston in my 20s to Philadelphia. But I moved back and I basically won’t live anywhere else. I like New York but I wouldn’t want live there. How do you like Boston? What’s your favorite part about the city? Or anything you dislike? 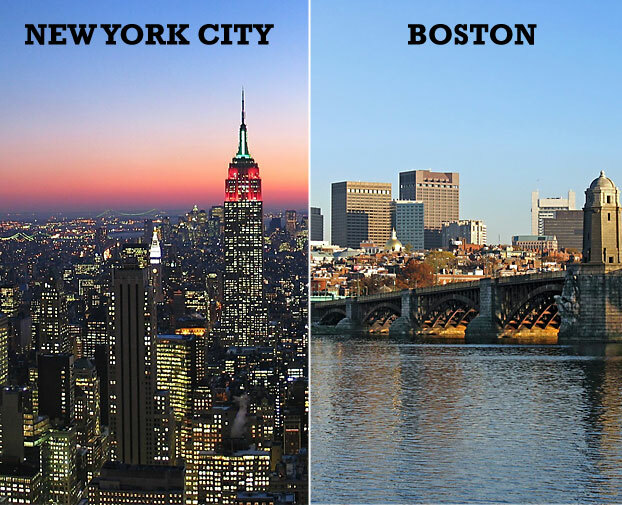 Boston is a more neighbor city, compared to New York. It is also much smaller. It’s a very well temper city. It shuts down at 2:00 in the morning when New York just goes. It is a much slower pace city. I love the pace of the city as much as I get old, I appreciate it. It’s a very comfortable to live, it is easy to get around, if you know, drive. It a vital city, but it’s also a very old state city. Among American cities, Boston is one of the oldest. New York is actually older, but Boston seems older. Anything dislike…. Well, It may not as creative as New York. Sometimes it costs a lot to live, but never costs as much as New York. If I hated it enough, I would move away. But I never hated it enough to move away. What about other parts of the United States? You go to Dallas. It’s flat, flat to see nothing. You are driving for hours in a straight line. I was there in summer and it’s 115 degrees every day. It’s dry. You can’t be in America without going to Las Vegas. It’s made up. It’s a plastic city in the middle of desert, exit to take your money away from you. No matter wherever you go, you always have something been taken. It’s cheap to get there, because they want you to spend money there. Only in journey, you can realize how big this country is. Texas is absolutely another country. More natural scenes are in the West. One of the things you realize about this country is the scenery, is really the natural beauty. The cities are interesting. But it’s the beauty of the country side I recommend to you to travel around.